So this little tumble was taken . . .
drifting along. The day is done. lingering in the glowing dawn. rollin’ in like a lonely tumbleweed. both lookin’ for somethin’ solid to eat. sleepin’ ‘til sun was deep in the west. he saw the bar; he gave his regards. suggesting Dundee’s time might be nigh. It’s a bitter tale to recall, dear friend. Pete never knew he shot his brother. close by the tide line. a day of new life for me. the burden for journeys to come. Rivulets chased after the ebbing tide, sighing softly against the sand, lovers parting just as they had done that distant day. The sea rushed forward once more to clasp the shores sandy face in a sweet embrace and kiss away the briny tears, only to leave again however fleetingly. The never ending bitter-sweet love story of the shore. She wondered if he would return, if he would rush to hold her close once again. The gentle breeze seasoned her lips and inspired a tumbleweed to skip along the waters edge, a knot of mermaids hair. The softly foaming manes of white horses lapped playfully at her feet. These gentle colts would grow to fiery stallions with the spring tides, stampeding along the coast, leaping and taking flight, their breath to fall like rain. The shore had its seasons just like the prairie. Both were ever changing yet never changing. The sky was a beautiful blue. Blue on blue on blue above the graphite shaded sea. It reminded her of his eyes. They showed his moods just as clearly. Were they still bright and alive or were they dead and turning milky as his body lay torn in a bloody, muddy battlefield? She shook herself. She knew he’d return just as surely as she knew she’d still love him no matter how broken this war left him. Civil war. There was nothing civil about it. A sour taste crept into her mouth. Turning, she walked slowly toward the path that would eventually wind its way to their small house with its few acres. Her skirts felt heavy, the bottoms darkened by the water. Heavier still was the rifle she carried. It dwarfed her small frame but she clasped it against herself with her small, pale hands. She was glad of the weight. It kept her anchored in the here and now. She’d promised him she’d always carry it. He’d worried the fighting would spread this way but so far the only action it had seen was taking a rabbit or deer by the creek. She prayed he’d be home soon. See’in yearlin rump,tail a wavin’. Hand full of rope to gather. Caught up in the slack. Just a comin’ off Cedar Back. Sure’nuf a flyin’and kickin’ up stones. In a weed eatin’ style. Over a Cedar Back rock pile. Stickin’ low in the saddle. On the heels of this-here critter. Ol’ bronc still between my knees. Catchin’ them bawl’lin horns with ease. Now the catchin’ get’in tougher. An the Sun,is get’in low. Than this old Cowpoke us’ta know. Did it drift in from the sea, or roll in from the plain? are measured up for bigger things. made in haste or agony. are alone with our own hearts. are faced down by ourselves. A journey’s end or its first acts. A leap of faith or a final chapter. Fresh starts or the last loose ends. taste salt or find sand. I rose to watch through the peachy haze. You and me, summer is our name. knows the wind, she’s a friend. 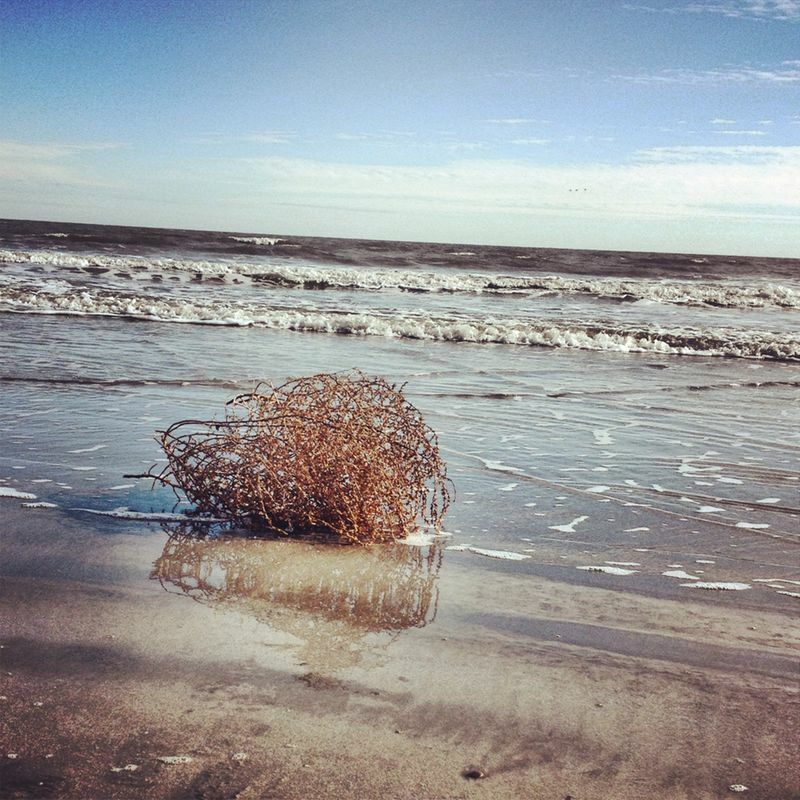 Wild and free, just like me, tumbleweed, tumbleweed. somewhere, somehow, that you once knew. chasing ghosts that you once knew. Thinking about roots and a room with a view. drink deep this life you found, tumbleweed.